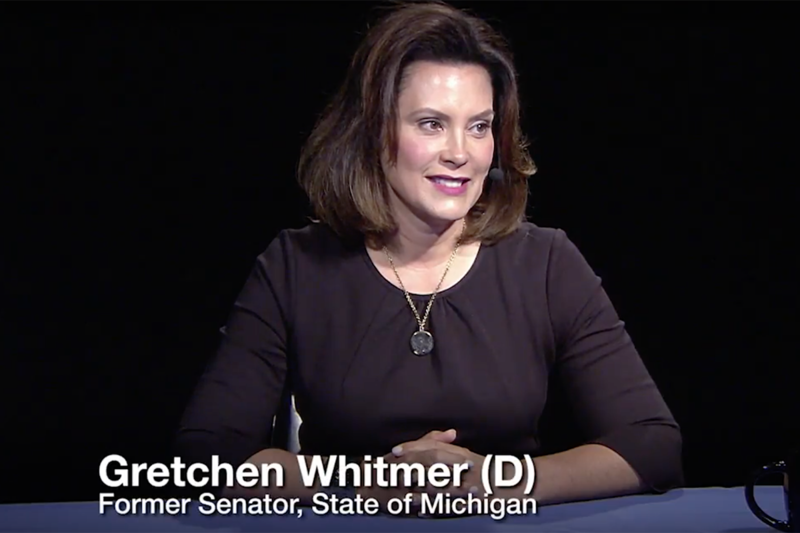 Gretchen Whitmer of East Lansing will face off against Republican Bill Schuette of Midland in November. Former Senate Minority Leader Gretchen Whitmer won the Democratic nomination for governor Tuesday, finishing far ahead of two opponents who ran unabashedly progressive campaigns. Whitmer, a favorite of the state’s major unions and Democratic leaders, was the presumed frontrunner in the race. At just after 10 p.m., it appears former Detroit Health Director Abdul El-Sayed will finish second, while Ann Arbor businessman Shri Thanedar will likely come in third. Whitmer was leading with just over 50 percent of the vote with 28 percent of precincts reporting. Whitmer will face Attorney General Bill Schuette in the fall, who trounced his three Republican rivals. "We are standing here primed to win in November," Whitmer said during her victory speech. She was proud "to be on a Democratic ticket that was having a great debate among the most diverse group of candidates in Michigan's history. I extend a hand out to them. ... There is a place for you as we move forward. I appreciate your spirit and your energy." It was a high-stakes primary for a party that’s hoping to ride a “blue wave” back to power in Lansing and is still grappling with internal fault lines exposed during the 2016 presidential election. The contentious primary season begged the question: Would the Democratic Party bank on a battle-tested liberal politician with existing inroads in the party apparatus, or veer left and elect an inexperienced but optimistic progressive in El-Sayed who proposed sweeping changes? Tuesday’s results indicate the former. "As frustrated as you may be, I need you to put that aside tomorrow and fight to make sure Bill Schuette is not governor of the state of Michigan," El-Sayed said during his concession speech Tuesday. Whitmer ran on Democratic planks such as shutting down the Enbridge Line 5 pipeline in the Straits of Mackinac, increasing funding for education and infrastructure improvements. But her proposed policies were reliably more moderate than those of her competitors, who pushed for a single-payer healthcare system, tuition-free four-year college for most Michiganders and a $15 minimum wage. "Gretchen Whitmer is a tough, determined, and proven leader, who will be an unrelenting champion for our middle class as the next Governor of Michigan," Michigan Democratic Party Chair Brandon Dillon said in a statement. "We’re excited that she’ll be leading the fight this election to bring the change needed in Lansing." Whitmer's offer of "a place" for her two opponents could be a brilliant move. If she actually gave active visible positions to each, and adopted at least one of each opponents signature positions - it would consolidate the democratic ticket in a very powerful way.